According to the Encyclopaedia Britannica, the name “Vodka” is a diminutive of the Russian word voda (water) and Polish word woda. It is a clear basically tasteless liquid consisting mostly of water and ethanol purified by often multiple distillations from a fermented substance, such as grain (usually rye or wheat), potatoes or sugar beet molasses. Samurai Vodka - Russian designer Artur Schreiber made this package and bottle look like it was cut in two by a samurai sword. However it’s only a concept, no vodka destiller has been using it yet. The fact that almost every country in the world now produces vodka, ranging as far apart as Australia, Vietnam, Holland, France, the USA and Mexico, doesn’t change the basic fact that there is only one area in the world that has a true heritage and a long history for making vodka. This area, called the Vodka Belt, stretches from Russia, Ukraine, Belarus, Poland, through the Baltic States and Finland, to Sweden. In these countries vodka is traditionally drunk neat, while its popularity elsewhere owes much to its usefulness in cocktails and other mixed drinks. Therefore the saying goes that vodkas originating from countries outside the vodka belt will, perforce, never have the same level of taste, quality and authenticity as products coming from within the vodka belt. It is like Scotch whisky and French Champagne. 1 - Jean Marc XO vodka - France - Four particular kinds of wheat are selected and separated from the chaff (to eliminate any hint of bitterness!) to be fermented and then distilled nine times in an Alembic Pot Still, micro-oxygenated, diluted with pure Gensac spring water and finally filtered through Limousine Oak Charcoal. 2 - Liquid Ice Vodka - USA - Handcrafted by Silver Creek Distillery in Rigby, Idaho it is a multi-grain distilled, certified USDA organic vodka. Water comes from a Snake River aquifer; and the corn, barley, wheat, oats and rye are from certified organic farms. Liquid Ice is sculpted in glass, shaped like a tower changing form from solid to liquid. The bottle infuses light like a prism, creating a unique one of a kind form of artwork. The top, is eco-friendly, reusable and crystal like, once removed it becomes a chilling glass for the perfect drink. 3 - Kai Vodka - Vietnam - A bright and complex nose with hints of sweet spice, vanilla, and tropical aromas. Handcrafted in Vietnam, Kai Vodka is distilled from rare Yellow-Blossom Rice that is grown in small villages along North Vietnam’s Red River Delta. Kai Vodka is handcrafted in small batches using techniques that have been handed down for over 6 centuries. 4 - Regalia Gold - Russian vodka matured for six months in vats lined with white gold. Smells of glass, sand and grain. The palate entry is sweet, waxy and quite delicious; at mid-palate there’s a thrust of minerals, wheat and a leanness that’s crisp, acidic and very refreshing. This situation underlines the staggering fact that, according to some extensive research, shoppers never even notice two-thirds of the products on the shelves. And that’s when they’re actively looking for something in that category. 1 - Purus - Distilled in Italy, bottled in Holland - 100% organic vodka made from Italian wheat and water from the Alps. Designed by Jean Scholtes, Creative Director of “White Space”, the bottle was shaped to look liquid-like and symbolize the crystal clear purity of the Alpine water. Everything about the bottle and label is eco-friendly and recyclable - soy-based inks, sustainable cork, and even a green adhesive. 2 - Crystal Head Vodka - Canada - This "Pure Spirit", vodka triple filtered through polished crystals known as Herkimer diamonds, free of additives, is brought to you in a skull. Crystal Head Vodka ties in with the story of the 13 Crystal Heads that have been unearthed at various times on our planet... from the Yucatan to Tibet. The Heads are believed to emit positive energy, good will and prosperity. Designed by sculpture artist John Alexander, Crystal Heads only found one glass blower in the world – Bruni Glass, S.p.A., in Italy – who was able to make the skull perfectly with no blemishes or bubbles. 3 - Legend of Kremlin - Russia - As the legend goes, in the early thirties of the fifteenth century, monk Isidore from the Chudov monastery in the Moscow Kremlin devised a formula for the first Russian vodka. Equipped with brilliant education and access to distillation equipment he was in possession of all the prerequisites for the creation of a radically new alcoholic beverage. And here the packaging designers and brand managers have to step in. It is long-accepted that in package design colour was the dominating factor, followed by shape, graphics, and text. But as colour in an exhaustive rainbow is screaming from the shelves, shape might be in a better position to attract the consumer. 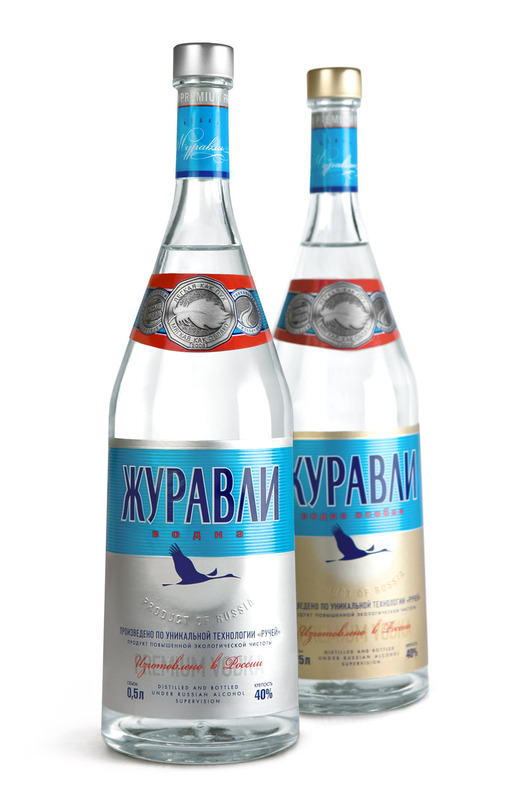 Vodka traditionally is packaged in glass bottles. Glass is one of those materials with almost unlimited possibilities in shaping and a wide range of decoration techniques. As a consequence spirits brands are masters at crafting shapely bottles. The world’s biggest vodka brands, trying to elevate their simple bottle design to iconic heights. 1 - Absolut - Sweden - This Swedish Vodka is now the number one selling vodka in the world. Introduced in 1879 as an absolutely pure vodka which used a new distilling process called rectification. The clear bottle is styled after an old Swedish medicine bottle. Made from locally grown wheat and well-water from the town of Ahus in southern Sweden. Smooth and light-bodied with some liquorice flavours. 2 - SKYY - USA - Inventor and entrepreneur Maurice Kanbar created SKYY Vodka in 1988. The cobalt blue bottle was introduced in 1993, switching from the clear glass bottle it was first sold in. SKYY Vodka also had a promise when it came out, hangover free. 3 - Smirnoff - USA - One of the world's leading premium vodkas, is now owned and produced by the British company Diageo. The Smirnoff brand began with a vodka distillery founded in Moscow by Pyotr Arsenievich Smirnov (1831-1898), the son of illiterate Russian peasants. It is now distributed in 130 countries. 4 - Stoli - Russia - Three key elements distinguish Stolichnaya from its imitators. First, it is distilled from superior winter wheat rather than lesser grains like corn. Second, it is made with only the purest, softest glacial water rather than processed water. Third, it is put through an elaborate, time-consuming double-distillation process that requires quartz and activated charcoal filtration. The result is a vodka of spectacular smoothness and clarity that outshines all others when served straight in the Russian tradition. 5 - Russian Standard Original is recognized throughout its native homeland as the ultimate benchmark for all Russian vodkas. Conforming to Professor Mendeleev's original formula, it is a superbly smooth spirit with a pure taste that maintains the characteristic bread flavour of traditional Russian vodka. The unique shape of its specially textured bottle reflecting the depth of the product's Russian personality is inspired by the 200 tonne bell commissioned by Tsarina Anna I, which stands at the foot of the Ivan the Great Bell Tower in Moscow. Featuring Dmitri Mendeleev's signature as a mark of its absolute authenticity and historic ancestry, Russian Standard Original's striking packaging presents a dramatic evocation of Russia's Imperial past and the culturally important place vodka holds in Russian life. The small (sometimes traditional) brands and the newcomers in the market are the ones which enrich the packaging world with exceptional designs. And the consumer? It is like choosing wine. Recent research showed that the consumer chooses his wine based on the label of the bottle. And that’s exactly what is going on with the vodka. Exorbitant designs, shapes, decoration techniques and colours seduce the consumer to buy, even if it is only for the bottle as a collector’s item or as an exclusive present. 1 - Ultimat Vodka - Poland - Ultimat is the only vodka blended from three distinct Polish ingredients: potato, wheat and rye. Its crisp, clean taste is assured by the use of artesian well water and candle filtration. This results in flawless purity and its unique hydro-selection method of distillation ensures superb overall quality. The Ultimat Decanter is hand crafted using the finest Polish crystal with a deep, rich Cobalt Blue colour, sealed with a natural cork. 2 - Elegantly sophisticated and domineeringly artistic, Bong Vodka is a super premium spirit. The Bong Spirit Import Company released the vodka in 2006 after travelling the world to seek out the ideal vodka. They found such a spirit in Holland, where a master distiller has carried on the art of distilling the same vodka as four generations of his family before him. Uniquely designed bottles also contribute to the brand’s characteristics. The bottle, which takes the shape of a bong and led to the brand name, clearly stands apart from every other brand on the shelf. Bottles are produced in Milan, Italy using crystal flint glass and are individually numbered. Artist Jimi Beach developed the concept of the Bong Spirit brand. It is certainly a well-designed marketing strategy that not only redefines the spirit world, but also the art community. Bottles of Bong Vodka have a distinct shape, are made with fine glass, and topped with a chrome overcap. While the original design is a marvel of its own, a collector series of bottles featuring the art of several up and coming artists is also available and are randomly packed with the unadorned bottles in each case that is distributed. 3 - DQ Vodka - Sweden - A new super premium vodka made by the Nordic Spirit Company. It comes in a bottle inspired by nuclear engineering which is said to resemble plutonium rods. The bottle is designed to be functional as well as having aesthetic qualities: as it is poured, the vodka is drawn through a central shaft, enabling oxygen to get into the liquid and allowing it to breathe. And so it came that during the last 10 years vodka has changed from being purely a drinks business to becoming a luxury goods business. It is even more about lifestyle, fashion and elegance than the beverage inside the bottle. 1 - Double Cross - Slovakia - Bottled in a foot-high, rectangular, 750-millilitre glass container the vodka is made in Stara Lubovna, Slovakia, Double Cross ranks as the only Slovakian vodka available in US. The glass bottle sides feature silk-screened verses of old-world poetry. The metal closure has an individually numbered tamper-evident seal. The embedded metal logo represents the Slovakian flag and coat of arms. 2 - Wyborowa Single Estate -- Poland - Limited edition that propels the brand into an unusual, contemporary universe and which outlines the distinctive character of this Polish vodka: the letter W refers both to the brand’s name and to the word, wodka, the Polish spelling of vodka. The bottle is designed by renowned architect Frank Gehry in a hand-crafted gift box also designed by Gehry. 3 - Kauffman Russian Vodka - Russia - Private Collection. The world's first and only vintage vodka producer. Only the finest wheat from a single field in one of Russia's top wheat regions is selected for this ultra-premium vodka. The bottles are produced at the Saint Gobaine glass factory in France from perfume glass, and are sealed with Guala caps manufactured in Italy. Each bottle carries its own unique limited edition number. A symbol of post-Soviet bling. Buy the traditional ones from the Vodka-Belt to enjoy your vodka pure and ice-cold or buy the fancy ones (still a good to perfect quality) for decorating your house and ‘spicing’ a cocktail party. Enjoy the results of designers to score with consumers. I personally like it pure and simple. 2 – Several of the descriptions of taste and origin as well as some photographs I took from the Hi-Time-Wine website. If you want to see more bottles (and love their content) go there, you can even buy them including the vodka. The website is worth a visit. Great overview. I would like just to add just couple of things to this article. In Russia in local and traditional stores shelfs with vodka extremely crowded. It is hard to pop up. Generally there are 2 consumer occasions, first when someone buying vodka for himself. Second if someone buying bottle as a gift. In first case people prefer to buy well-known brands like Stoly, it can be not very expensive and key factor of design effectiveness is recognizability. In second case shopper looking for some non-standard shape, label design, gift box substrates etc. It is crucial to understand who your target consumer is when you start working on vodka bottle/label/box design. I have no numbers but I quite sure brands focused on first occasion doing much better than the rest, especially n current economic environment. Interesting fact is every 3-4 years in Russia we have brand-new proposition which become very popular because of good cost and great quality. Usually these ‘newcomers’ leveraging somewhat traditional approach in bottle/label design. Indeed a redundant posting. Looks like the author hit the vodka bottle on this one!